Unicorn license plates are an excellent way to upgrade the appearance of your regular license plates. 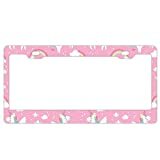 These colorful and vibrant Unicorn license plate will make your car stand out. They will also show off your love for unicorns no matter where you are or where you plan to go. The license plates are made to resist the harshest weather conditions so you can be sure they will serve your car for a long time. TOP SHIPPING AND CUSTOMER SERVICE: After you make order,you will receive item in 3-5 days.And we have patient customer service to serve you. BEST DECORATION FOR YOUR CAR: Add some bling to your life with The GND's new and improved Bling License Plate Frames-bigger, brighter and with more bling than any other license plate frames out there. EASY TO INSTALL AND ANTI-THEFT: quick and simple installation with easy to follow instructions.Easy installation with included mounting screws. Anti-theft caps to keep your plates safe and secure . TOP WORKMANSHIP: Prong Setting Diamonds, Tough, Durable and Stainless Steel Frames, with Resistant to Rust Glass Diamonds(Not like other cheap fake PLASTIC crystal) for extra sparkle . FOR U.S. LICENSE PLATES: High quality metal license plate frame which fits standard US & CANADA license plates . 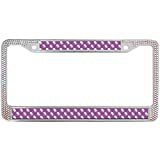 Material: These License Plate Frames are made of automotive grade high quality Alumina. This kit provides a gorgeous and sleek finish to any vehicle and do not obstruct view of any words or registration numbers on your license plate.